I love reading so when I saw a deal for the newly re-born Book of the Month Club, I had to subscribe. It's an interesting subscription that allows you to choose the book you would like from a shortlist of five new books each month. So far none of the books have been ones I've read, though I have heard of most of them. 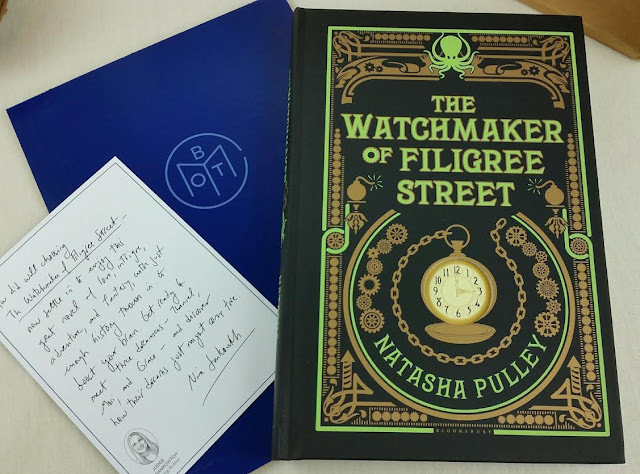 The Watchmaker of Filigree Street by Natasha Pulley- I'm a big fan of fantasy so this choice was pretty easy. 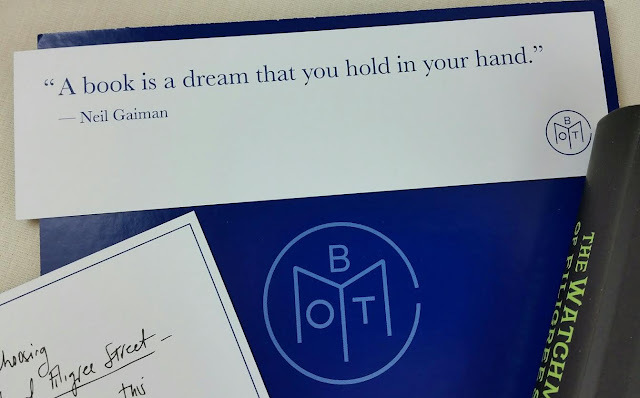 Not to mention it was featured in a different book box that I wished I had ordered (Muse Monthly). I did feel a slight pull toward The Witches but had to go with my favorite genre. I can't wait to dig in. I feel like my book list just gets longer and longer! And I joined Goodreads and my list quadrupled overnight. That website is a danger zone for book addicts. I set myself a goal of 200 books for this year. I'm at... 165 so far. Not sure I can get 30 more in by the 31st of December but I'll try. I probably did forget a few but oh, well. Oh, you do get a quote bookmark, too. I forgot about that. VERDICT: If you love hardbound books or increasing the amount of books on your shelves. Book of the Month Club is going to be right up your alley. I like my Kindle and tend to download my books from the library rather than paying for them but the feel of a book in my hands is always refreshing. My bookshelves are overflowing but I just bought another one so... Hah! So far, BOTMC has been on target value-wise, saving a few dollars over regular price with the month-to-month subscription. Even better however, is a deal! You can subscribe for 45% off using code BOTM15. Now that is an incredible deal! I hope the code is still working, I can't check for myself. No expire date was indicated. I could NOT decide between this book and the one about Witches, so I went with the Witches book. I wish I'd chosen this one. It looks like fun, whereas the jacket of Witches looks grim in comparison.